The two Steves- Bee and Jay have been vanguards of technology – and yet the difference between them couldnot have been stark. Everything Jay was Bee wasn’t. Bee’s accomplishments are an antithesis of the achievements of Jay. 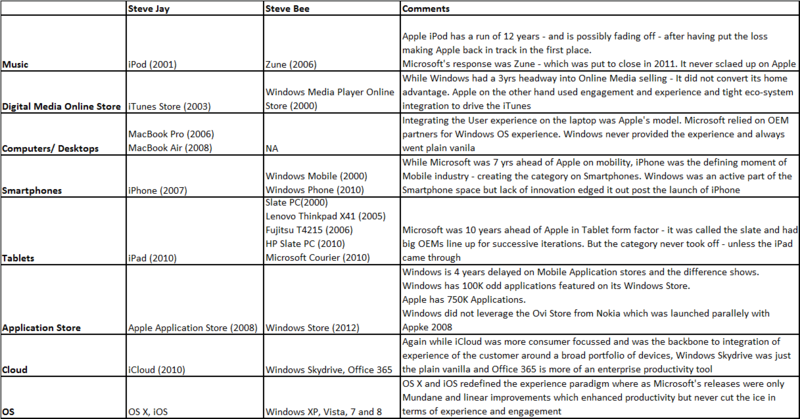 This is the follow up on my earlier post – Microsoft’s lost decade and it looks down upon (Literally) on Bee’s big judgement errors…. The list doesnot quite stop there – There’s Microsoft’s wasteful effort on Bing versus Google and its advetures with XBox and Kinect versus Playstation. To me Xbox and Kinect were ideal innovations – but Microsoft and Bee failed to push it… across platforms. Microsoft worked across disparate platforms and was never able to integrate the customer experience across devices and platforms. And then again, projects such as Microsoft courier never saw the light of the day – the plug pulled out through half way. Bluntly put – Technology is one thing – the ability to conceptualize the portfolio, integrating the services in a manner of user experience that is engaging and habit forming, a layer by layer structured format of business allowing scalability of services and devices into different domains is something that Ballmer missed upon very completely. Take an Apple for instance – It started with an iPod, created a layer of services around it (iTunes), scaled the device into new form factors , upstaged the Music industry, leveraged the design into a smartphone (iPhone), scaled up another service layer (Application Store), upstaged the industry and leveraged it yet again for new device/dimension (iPad) and upstaged the industry all over again – there is this continuity in design, form factor, service, portfolio and monetization streams. Instead Microsoft had a Windows media Player, a Zune, a Zune Media Store, an Xbox and a Kinect, a Surface – they are all great pieces plagued by a discontinuity. The best examples being xBox and Kinect – good innovations, mind numbing possibilities and yet these innovations have struggled to give Microsoft worthwhile mileage. What they said … when Steve was asked to retire is not all that great! Steve (Jay) put the Microsoft problem in a neatly worded statement: “ The trouble with Microsoft is they have no taste. They have no taste and I don’t mean that in a small way, I mean that in a big way.” Absolutely right Steve! Ballmer’s successor clearly has an awful lot of work to do…. How the high and mighty fall aside to give way to new blood! Thats the perpetual script of the mobile phone industry… You miss the bus once – there isnt any catch up left to do. Industry marquees such as Nokia, Motorola, Blackberry, Sony, HTC have seen their growth and margins erode – caught unawares amidst scope and landscape changes. There seems to a pattern where each vendor reaches a peak share, though that peak varies greatly in value and then goes into a decline, which again varies from drastic to gradual. The only ones who have bucked the trend so far is Samsung and Apple – though Apple is beginning to show weakness. However, if the industry trend were to continue Samsung would hit its decline within an year – give it a couple of years at maximum. Steve Ballmer, CEO Microsoft since January 2000 is to retire from his post within the next 12 months. Rumours are that our man was asked to march since the board was not too please about the $900 Million write offs on a spate of current projects. Within a few hours of this release, Microsoft stock jumped by $2.36 (7.3%) over a broad trade of 223.3 million shares. The news of Ballmer’s exit added an immediate $20 billion to Microsoft’s capitalization. The movement of the MSFT scrip shows a variance of 97 cents on 23rd August with the share touching $34.97 post Ballmer’s Announcement. Initial Euphoria? Over the course of last 14 years, Microsoft hasn’t really done significantly different – besides sharing the spoils with investors in terms of dividends. Yes, it has increased the market capital of Microsoft – but as far as results go – there is hardly anything much on the board. 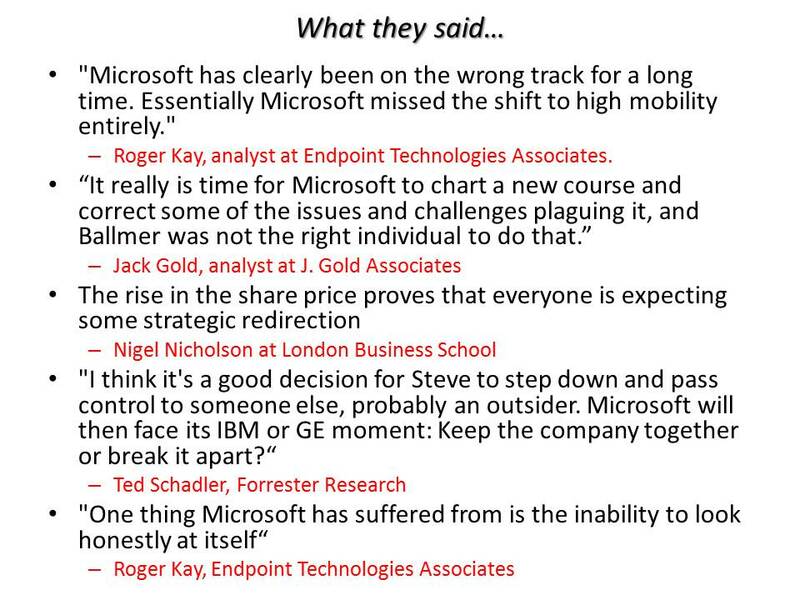 With Ballmer at the helm – Microsoft has actually offered negative returns. Ballmer can be credited with an effort to shift strategies at Microsoft – but it didnot really pay off. If you compare the indices of Microsoft versus Dwo Jones, NASDAQ and S&P500, the picture that comes through is an eye opener. To put the numbers – Dow Jone outperformed Microsoft by 3X in Ballmer’s Decade, S&P outdid Microsoft by 10% through the Decade. The face saver was NASDAQ, the technology index itself dropped by 10%. Compare Microsoft’s stagnant share price to 700% increase in Gooogle’s share price value and a 1600% escalation in share price of Apple. 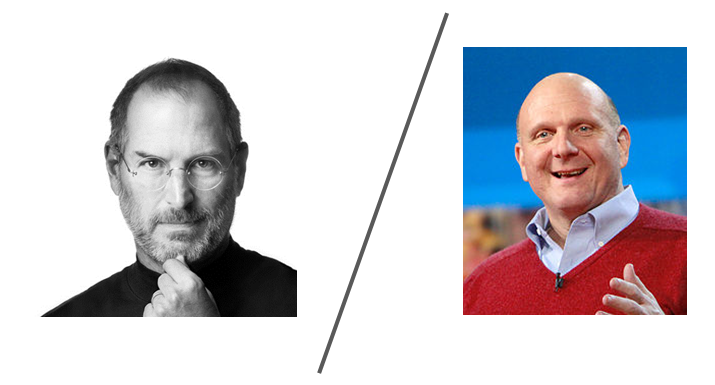 Infact, Apple’s Get a Mac campaign was a very clever lampoon of the archetypical Ballmer personality. In Ballmer’s decade, Apple overshadowed the Redmund giant and emerged as the quintessential technology business after bringing the revolutionary iPod, iPhone, and iPad platforms to market. To date, only Google Android has emerged as a formidable rival to the popular Apple iOS operating system. Meanwhile, Microsoft and Ballmer have been literally caught with their pants down. In hindsight – Ballmer never really estimated the eco-system effects and advantages and consequentially was never able to capitalize. Ballmer met some degree of success with the Microsoft XBox and Kinect – the only game changers. However, XBox and Kinect have not translated into any huge seismic impact – quite unlike the other Steve in town – the one from Apple. 4. 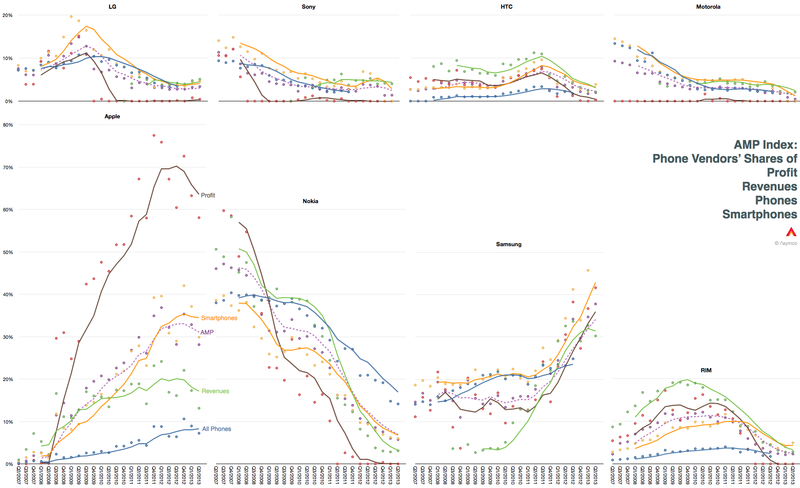 At low single digits market shares in Smartphones and Tablet markets – Microsoft is a relative non factor. 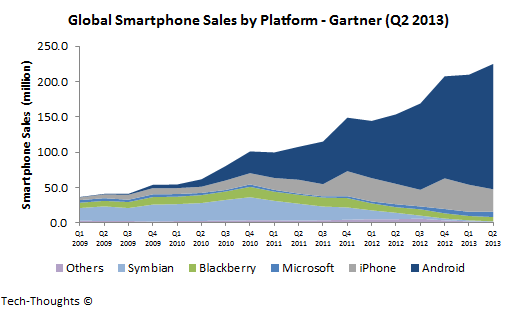 At Microsoft’s scale – they ought to be looking at upstaging Android and not be overjoyous about the decline in Apple. It is perhaps ironical, that Microsoft and its Wintel partnership must fail to Moore’s law. Wintel understood the law pretty well in terms of size and power management principles – but miscalculated the consumption shift towards smartphones and tablets. 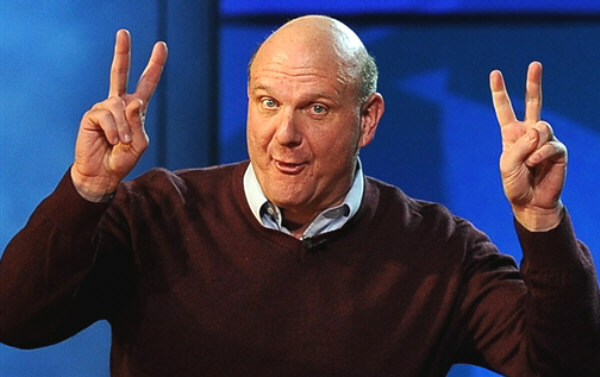 To sum up, Steve Ballmer has been very instrumental and effective in running existing product lines – but in terms of innovation and new products – Ballmer has been less than good and the 13 years at helm of Microsoft have been years of opportunity loss – Microsoft’s lost Decade. In terms of nerd magnetism, nothing on the road compares to the Model S, with the possible exception of the Google’s Self-Driving Car. The car has a touchscreen instead of the usual physical buttons on its dashboard controls. There’s the novelty of the electric drivetrain, and the 17-inch touchscreen lets the driver pull up massive, full-screen maps or open the sunroof with a finger swipe. The car alerts drivers when they’re near a charging station and can be programmed to recharge at home during cheaper, off-peak hours. The outside handles retract flush into the door when not in use. And, like any hot gadget these days, the car has apps. In an online forum, an owner in Illinois asks for a software update to the remote climate-control system so he can override a timed shutoff and keep his dog cool while going to lunch. Someone else has written an app that pairs Google Glass with a Model S, letting an owner who’s forgotten where he parked see the vehicle on a map while its headlights flash. Even the flaws of the Model S seem to resonate with geeks. Early versions of the outside handles malfunctioned—they sometimes wouldn’t extend out of the door—and the windshield wipers seemed to have a mind of their own. Tesla fixed those and other problems with a software upgrade delivered via the car’s high-speed wireless connection. It’s part of being an early adopter. Following Tesla’s lead, General Motors and Ford have started hiring software developers by the hundreds, in GM’s case quadrupling its technology department. Software is in many ways the heart of the new vehicle experience. From the powertrain to the warning chimes in the car, you’re using software to create an expressive and pleasing environment. If there’s a secret to Tesla’s success, it’s been to outsource as little as possible. The company has insisted on doing just about everything it can in-house, which has helped it develop intellectual property and control costs. Tesla built the battery pack replacement feature into the Model S, for example, and then designed the robots that will do the work.Unlike every other major car company, Tesla has also kept its retail business in-house. It’s trying the Apple model of placing its own stores in high-end malls and shopping centers instead of relying on dealer franchises. Salespeople, who don’t receive commissions, help buyers configure their cars on giant touchscreens. The company has created an unusual financing program meant to assure buyers that their Tesla will retain its value when they sell it. If you buy a car through Tesla’s financing program, you get a guaranteed option to sell it back to the company at a price pegged to a comparable BMW, Mercedes, Audi, or Lexus. Should something go wrong with your ﻿car, Tesla will send a concierge with a new Model S loaner, repair your car, and return it. Tesla recommends the Model S be brought in once a year for servicing. The warranty is still valid if you don’t. 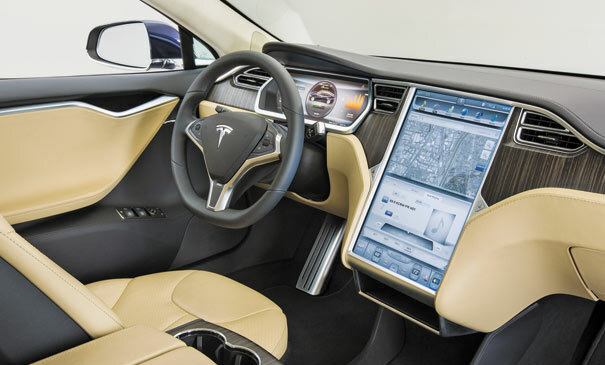 In many ways, Elon Musk’s Tesla S is akin to the leap of faith that Apple took with the iPhone. The Tesla S is leading the transition in the 100 year old of a Gasoline driven car to a performance vehicle powered by alternate and cleaner energy. Tesla: That moment in history where a new frontier is breached. It is that moment in history – when something is born and a new frontier is disrupted. 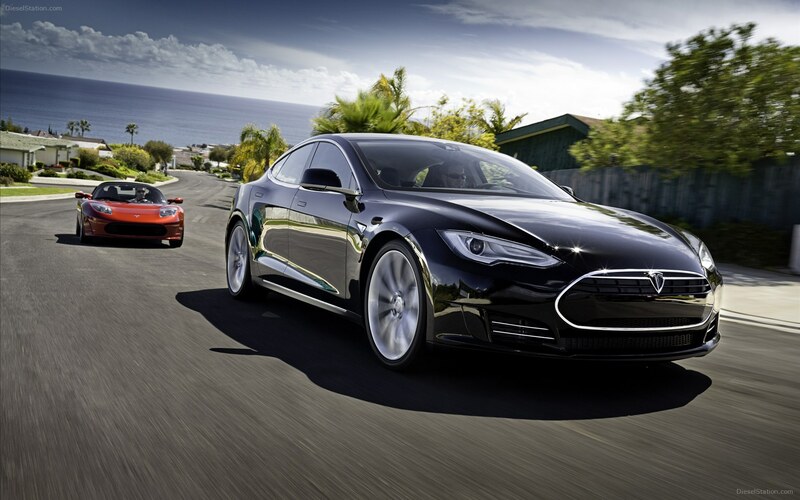 Tesla Motors and Elon Musk are re-scripting automobiles with the Tesla S.
3. There’s also a leasing plan option that Tesla and Elon Musk is working upon. In Tesla’s 10 years of existence, the company has suffered through embarrassing delays and leadership overhauls, verged on bankruptcy at least once, and been a favorite target of short sellers. In May it posted its first profitable quarter, with earnings of $11.2 million; sales for the first quarter rose 83 percent, to $562 million. Musk raised the 2013 sales estimate by a thousand vehicles to 21,000, an eightfold increase over 2012. A few weeks later, Tesla paid off a $465 million government loan early and then raised $1 billion from investors. The stock price has soared in the past six months, from $32 a share to $129.90 on July 15, before falling $18.21 in one day after Goldman Sachs published a skeptical report about the carmaker’s margins. Tesla has a market cap of about $13 billion, or about the size of Mazda Motor, which, according to a Bank of America Merrill Lynch estimate, will sell about 1.3 million vehicles globally in 2013. Much to the naysayer’s chagrin and Elon Musk’s advantage – the Tesla S outdoes most of the commercial units of day in terms of performnace. The Model S does zero to 60 miles per hour in 4.2 seconds, has plenty of room (including a “frunk,” a second trunk under the hood), and gets the energy usage equivalent of 95 miles per gallon. Last November it became the first electric to win the Motor Trend Car of the Year award; in May, Consumer Reports gave the Model S its highest car rating ever—99 out of 100. Tesla and Elon Musk are close to Apple and Jobs in 2007 – who took a leap of faith fundamentally redesigning the phone experience. The target is not to become the hottest car in Silicon Valley – The target is upending Ford, GM and the ExxonMobil. Traditional Camera makers face tougher times in markets with higher smartphone penetration. As smartphones with better cameras and increasingly sophisticated optics become the de-facto camera for consumers, camera majors such as Canon and Nikon are cutting their forecasts as camera markets entering long term declines. Consumers value the social networking aspect of smartphone cameras, which allow sharing of images immediately. Secondly the key is convergence and having to carry only one device and the convenience of a single terminal. In July 2013, Canon lowered its full year profit forecast by 16%. 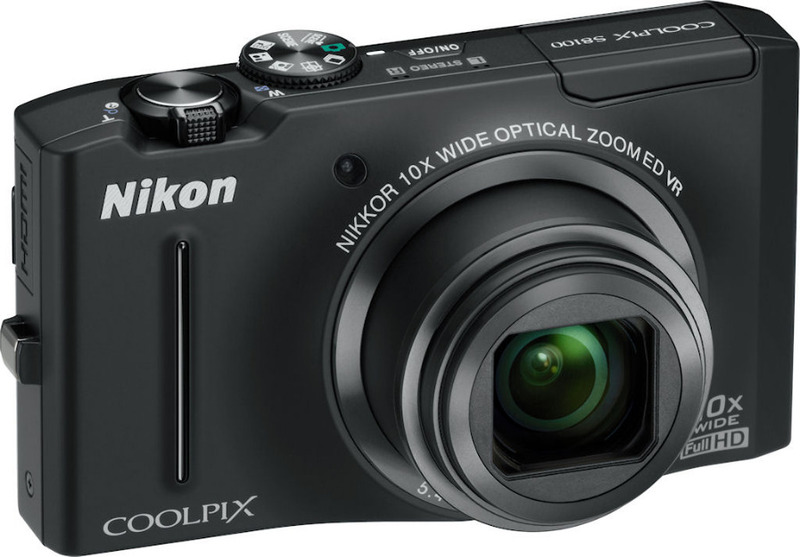 Nikon followed this by cutting profit forecasts, especially due to slow down in the digital camera segment. Slowly and steadily, Cameras are getting sidelined as specialized devices that cater to specific types of users, such as professionals and advanced amateurs. Worldwide camera shipments fell 29 percent in the first five months of 2013, according to the Camera & Imaging Products Association in Tokyo. IDC mirrors this sentiment and forecasts that the global digital camera market is forecast to shrink 29 percent to 102 million units next year compared with 144 million in 2010. On the other hand, smartphone shipments are expected to rise about 32 percent to 928 million units as per market-research firm TrendForce. Samsung, Nokia, iPhone, Sony and the likes are beginning to take over the casual photography and the digital camera space. Why Intel doesnot inspire any much confidence any more? As tablets continue to pound on Laptop and Netbook segments – and the Laptop/Netbook segment is at best projected to be stagnant if not decreasing in terms of y-o-y shipments it is difficult to harbor any significant optimism about Intel. Intel has been trying to migrate its business to the Handhelds given the impending fall of the Wintel Franchise. It is clearly trying to move away from the Wintel Monogamy to separate alliances with Android, Samsung (Tizen) apart from the Windows Phone platform. However, creating a platform with meaningful revenue stream to replace its Wintel franchise is a long shot – something it has not been able to do for a very long time. PC Client Group had revenue of $34.3 billion, down 3 percent from 2011. Data Center Group had revenue of $10.7 billion, up 6 percent from 2011. Other Intel architecture group had revenue of $4.4 billion, down 13 percent from 2011. Gross margin of 58% not broken down by group. 1. Intel Versus Qualcomm: Qualcomm with its leadership of the mobile space is possibly Intel’s biggest competitor in the mobile space. What works for Qualcomm is its economies of scale – hence allowing it to price itself very suitably. Intel chips in its current state would be 5X costlier than Qualcomm. 2. Intel’s specialty was the Windows platform and its complete monopoly. I don’t think they can repeat the same success with Google’s Android because the spots are already taken. 4. Either in terms of competing with Qualcomm or finding new markets, If Intel was to beat the market by considerably pricing itself lower (assuming very high volumes) – it would impact its profit margins dearly. 5. Intel has been innovating at the high end of the market. Thus, the cleverness that has gone into Intel’s current generation of high-end processors is simply stunning, but the market that benefits from that cleverness, and the margin that goes with it, is disappearing. 6. The only saving grace to this equation could be Microsoft – but the platform had its share of problems with Windows 8 and I am not sure if Windows Blue can reverse the tide. 8. The third of Intel’s strengths – high-reliability enterprise computing and high-end analytics for business or national security applications is also moving the IBM way. IBM doesnot make any profits on its processors – its makes it dough from the services. Finally, from cumulative experience of high end technology industry – any incumbent Goliath who missed one technology cycle – cannot by any means play catch up unless it re-invents the whole industry yet again. Intel doesnot have to look too far – beyond Microsoft – to learn missing out a technology cycle and losing the plot. Apple – Losing its Halo! The Apple board is concerned about its “dry spell” in producing innovative products. Apple has been missing in action for a while – October 23rd, 2012 was the last time, Apple launched the iPad mini. Ever since then the Cupertino giant has been largely missing in action. Twitter and Blogospehere – which was alive and abuzz disecting Apple’s latest launch or new launch have largely falled silent and one gets to read more about Cook versus Jobs comparison which is reminiscent of Apple’s Phoenix tale. This post is to put Apple’s profiling Apple’s share of problems. 1. iPhone and iPad both played a significant role in its growth since 2009. However there is slowdown in Apple sales and prices have gone southwards for a while now. In other words, loss of momentum. 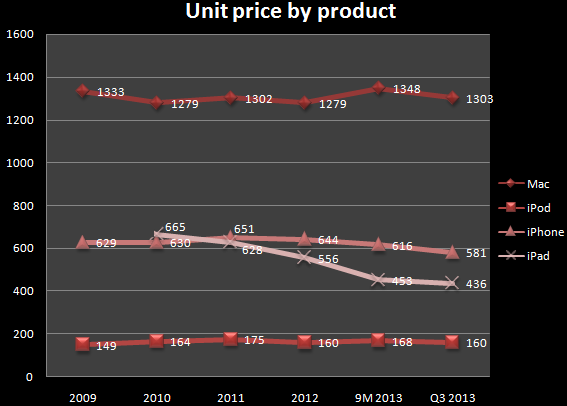 Apple seems to be not only losing its pricing power but also its sales growth despite the lower prices. 3. The decline in numbers can also hurt the iTunes, software and services, and accessories segments. While it is understood that Apple needs to target the China and the SE Asia markets with its low cost iPhone – iPhone 5C which should take on the mid range Androids and Windows Phones – this would translate in reduction of the overall margins. At the same time, Samsung Galaxy SIII has taken over as the Smartphone tops – disrupting iPhone’s positioning in consumer mind as the best smartphone. 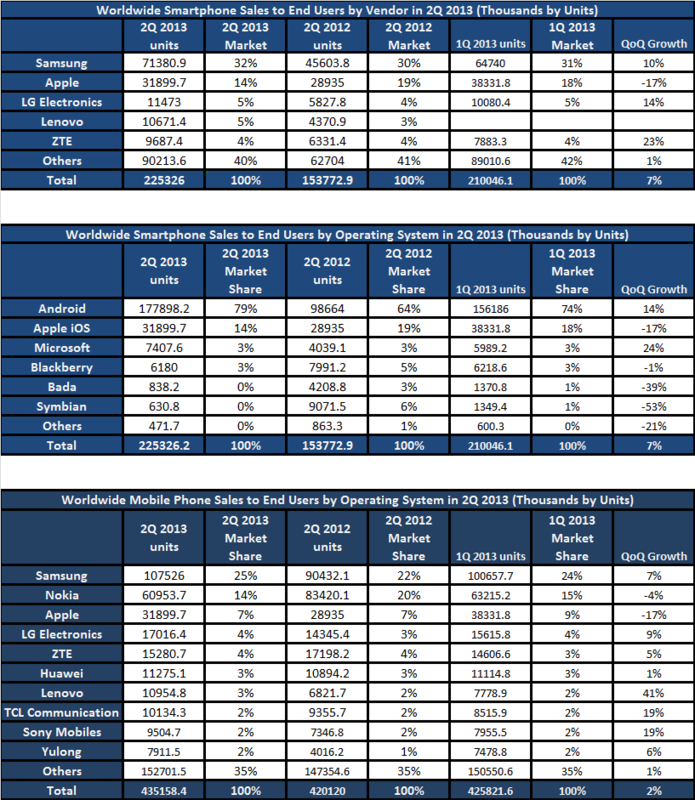 Canaccord genuity in its Q2, 2013 Smartphone value share reinforces the change in guard in the smartphone segment. Samsung seems to be riding on its multi-product Android portfolio to fork into Apple’s pie. 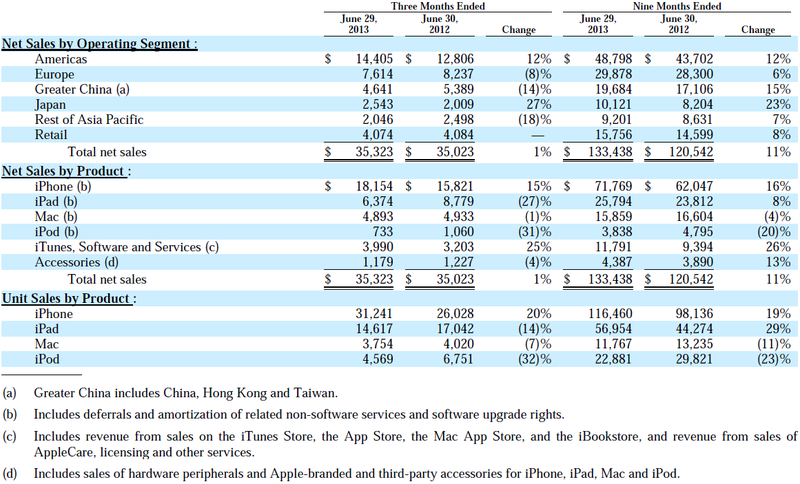 Apple has 53% of industry profits (as against 71% last year) and Samsung has 50% (was 37% last year). Samsung keeps gaining quarter on quarter and Apple keeps loosing. While Samsung and Apple generated $5.2 billion and $4.6 billion, respectively, in handset profits in the second quarter, according to research firm Strategy Analytics. By comparison, the mobile division of LG Electronics Inc., the No. 3 smartphone maker, had a $54 million operating profit with a 5.3% share in the latest quarter.The duopoly stands in stark contrast to the long list of companies jostling to establish themselves as a formidable player, including Nokia Corp., BlackBerry Ltd., Sony and LG. Even fast-growing Chinese manufacturers such as Lenovo Group Ltd., ZTE Corp. and Huawei Technologies Co.—all major brands in the burgeoning Chinese market—have yet to prove that they can deliver consistent profits in smartphones. Will a combination of iPhone 5S + iPhone 5C (Low end Apple iphone) be able to turn it around for Apple? 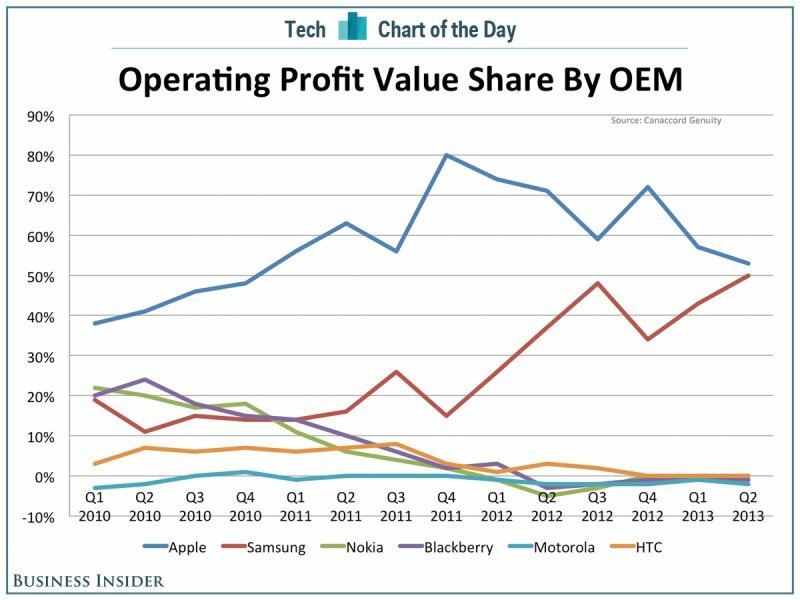 Samsung currently seems to have awesome momentum and might end of taking the No.1 position in Smartphone profits by Q4, 2013. What doesnot change is that the rest are truely “laid to rest”. From a consumer perspective, this duopoly can be damaging in terms of choices. Device Makers may start throwing in the towel – What with no profits and cash burns. NEC Japan is quitting business. HTC has reported a 83% drop in profits.